The projected route of Interstate 175 was to follow much of Georgia State Route 300 between Albany and Cordele. SR 300 varies between a four lane divided highway and an undivided four lane arterial between U.S. 82 & SR 520, outside Albany, and SR 300 Connector (old SR 257), south of Cordele. The stretch east from SR 300 Connector to I-75 at Exit 99 is a controlled access expressway with an interchange at U.S. 41. AASHTO established Interstate 175 on June 17, 1975 as a route running northeast from Georgia 333 southeast of Albany to Interstate 75 south of Cordele. 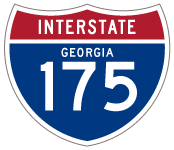 Georgia 300 replaced I-175 (and Georgia 257) in function between the two cities. Entering what was a full cloverleaf interchange (Exits 1B/A) with Georgia 133 along U.S. 19 & Georgia 3 south. This exit represents the end of the Liberty Expressway, the limited access bypass of Albany. Photo taken 09/18/06. Loop ramps from U.S. 19 north to SR 133 north and U.S. 19 south to SR 133 south were removed from the cloverleaf interchange between 2006 and 2010. This coincided with a relocation of SR 133 onto the Liberty Expressway between Exits 6 and 1 and an extension of SR 234 east to U.S. 19. Photo taken 05/30/10. U.S. 19 northbound at the off-ramp (former Exit 1A) to State Route 133 south to Moultrie. This ramp now carries both movements to SR 133 south and SR 234 west into Albany. Photo taken 09/18/06. Interstate 75 north at the diamond interchange (Exit 99) with Georgia 300 south and Georgia 300 Extension, a locally maintained road, east. This exit would have been the north end of Interstate 175 had the freeway been built. Photo taken 07/02/14. Southbound I-75 at Exit 99 for Georgia 300 south to Albany. Georgia 300 runs 106 miles south from the Cordele area to the Florida state line south of Thomasville. The state route replaced Georgia 257 and Interstate 175 as the primary route between the freeway and Liberty Expressway in Albany. Photo taken 08/07/13. The Georgia 300 expressway stems west from I-75 at Exit 99 to a diamond interchange with U.S. 41 and the south end of Georgia 300 Connector. The state route turns southwest from Cordele as an at-grade roadway to Albany. Photo taken 05/30/10.